After her well-to-do Aunt Sarah is caught shoplifting, Virginia Trent is convinced she needs to seek psychiatric help for kleptomania. So why does Virginia turn to legal eagle Perry Mason? Because a cache of valuable diamonds - left in Sarah's care - has suddenly vanished into thin air. Virginia thinks Sarah swiped the stones, but gem dealer Austin Cullens begs to differ. In fact, he's prepared to forgive and forget - until he is mysteriously murdered and Sarah is caught running from the crime scene. Now it appears the lady with the sticky fingers may have blood on her hands. 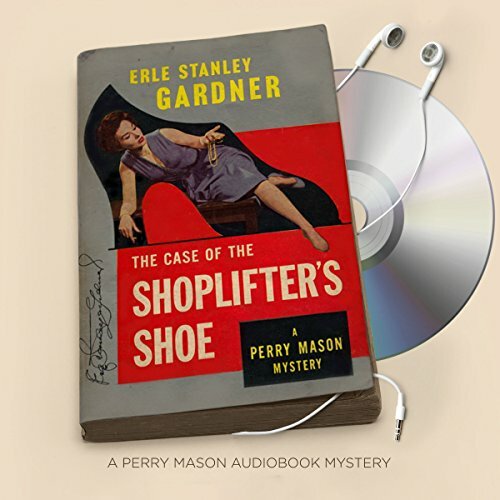 ©1938, 1965 Erle Stanley Gardner (P)2016 Brilliance Audio, all rights reserved. Good case, lousy title (the shoe doesn't enter into it much). Lots of courtroom yelling, which is fun. Poor judge! The case is normal Gardner (i.e. very complicated). Audio: horrible narration by Alexander Cendese. Yes, there are loads of characters, and he has different voices for each. Good. But most of them sound like cartoon characters. One came across as a parody of Marlon Brando's the Godfather. And why in the name of the gods does he make Della Street sound like a spastic chipmunk on helium?